How did members of 7th Regiment spend their recent snow day during the big northeastern snowstorm? Find out in this video. The Battalion is auctioning off two vintage instruments nearly a century old as part of a fundraiser. Blue Devils C will be performing in a parade Saturday, March 18, in Dublin, California. Bluecoats program coordinator Dean Westman has been named one of Indiana University’s Armstrong Teacher Educators, an honor awarded to just 11 teachers this year. Boston Crusaders’ 2017 Spring Preview event will be held in Bradenton, Florida on April 29. The cost for entry to the event is a donation of suggested disposable goods needed for the corps’ upcoming spring training rehearsals. In the latest “Hop Talk” video, Cadets director George Hopkins takes viewers inside one of the corps’ design staff meetings. Carolina Crown is seeking an athletic trainer to work with the corps during its 2017 summer tour. The Colts organization is seeking volunteer cooks, drivers, and sewers for this summer. Incognito has a second brass audition camp coming up on April 2 in California. If you have a lead on the availability of commercial restaurant convection ovens, Louisiana Stars is interested in hearing from you. Pacific Crest has a volunteer need for video production specialists. One lucky winner will go home with a new Mapex Storm Fusion drum set at River City Rhythm’s March 23 fundraising gala. Santa Clara Vanguard is seeking volunteers to help the corps during its pre-season rehearsals through California between May 21 and July 2. Seattle Cascades have been invited back to the 4th of July Colors of Freedom Parade in Everett, Washington, where the corps last year received the Judges’ Choice Award. Southwind added four additional 2017 spots for baritone players. Interested students are encouraged to attend the corps’ next rehearsal camp March 24-26. 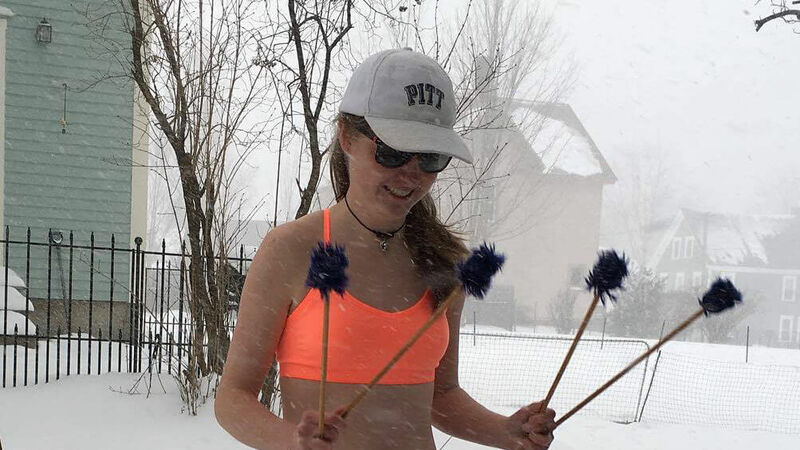 Taking advantage of the unseasonable snowfall in the northeast, Spartans launched a #DrumCorpsInTheSnow photo contest. Troopers posted a video featuring highlights from the corps' March reherasal camp. On Saturday, March 18, Watchmen will be holding an audition camp for the entire corps at Riverside High School in California.